The palace garden Schwetzingen offers numerous architectural treasures which add significantly to the importance of the park. 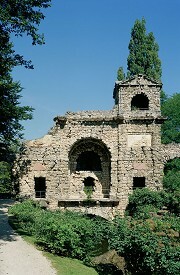 The so-called Roman water castle is a purely decorative building from the baroque period. 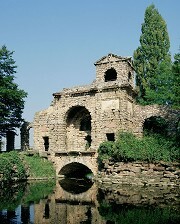 It is the imitation of a Roman ruin and offers from a raised lookout a great view over the park's scenery. Little is known about the historic background of this building, but greater restoration works are planned for the immediate future. My documentation reflects the state of the object before its restoration.